I am dedicated to providing high quality and timely in home service, to my customers, at a fair price. You can be assured that you will receive the most competent service, backed by 35 years of repairing consumer products, along with 13 years of teaching electronics at a college level. I provide the convenience of in home service to residents in Oakland and Wayne counties and Northwest Detroit. Farmington Hills, West Bloomfield, Wixom, Keego Harbor, Milford, Canton, Livonia, Westland, Garden City, Commerce, Southfield, Oak Park, Royal Oak, Huntington Woods, Berkley, Ferndale, Troy, Rochester and others. 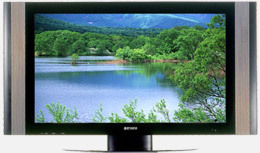 Today there are many different kinds of TVs, including LCD, LED, Plasma, DLP, and Rear Projection. The technology built into these sets are much more sophisticated than the old fashioned picture tube TV and consequently cost significantly more. Therefore, we can no longer treat these sets as throwaways. I work hard to repair, rather than replace worn circuit boards to keep the cost of the repair reasonable, and therefore practical. Click the red link above to view testimonials from some of my customers on Yahoo. All parts and service are guaranteed against the recurrence of the same fault for a period of 90 Days. Unrelated repairs are not covered under this guarantee.